Contemporary design is all about the here and now and how design in our present life is helping to communicate our style and make our life easier. Hotels that have a contemporary design and hospitality focus are hotels that want to communicate an effortless transition from everyday life and to your vacation. With contemporary hotel rooms interior designs, hotels will have design features that guests are used to and see in their everyday life. Natural light is something every interior designer tries to play up. 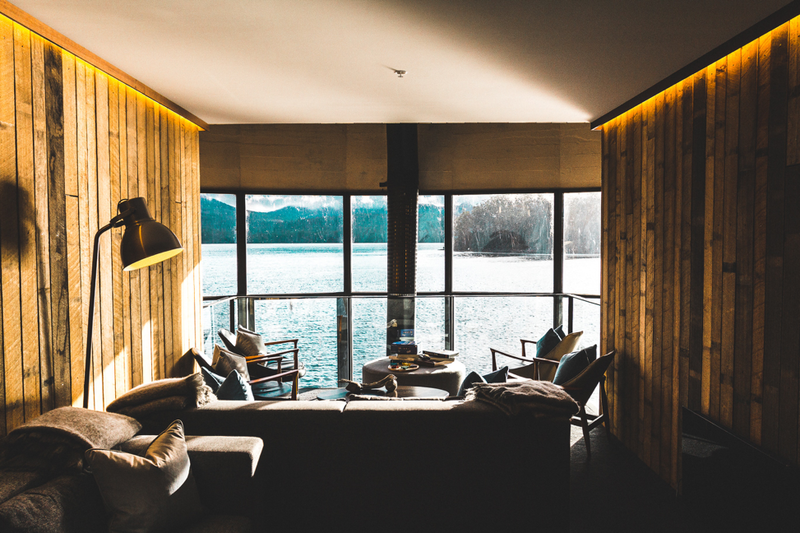 Natural light not only can make the environment of the room feel softer, but also add to what key elements will stick out. Contemporary design focused guest rooms will work to incorporate the use of natural light, and more often than not it happens through big ceiling to wall windows. Big windows not only let in a ton of light, but also give guests views of the scenery. Bold artwork is something that has not only become part of our culture, but also a part of the current contemporary design style. While, hotels are opting to keep their hotel walls clean and neutral, they are contrasting that by having bold hotel wall décor in the room. Where the artwork is placed in the room differs between hotels and the wall space that they have. While some might prefer it to be a focal point of the room, others opt for a subtler approach or have the artwork in the bathroom. However, styled, one thing is for sure. Bold artwork is a must. With indoor plants being a big trend for 2017 it is no surprise that it is a top 5 must have for contemporary rooms as well. With contemporary design being affected by trends, then this is an important one. With natural light being a big component for plant growth it is no surprise that the two work hand in hand and are both top 5 contemporary trends. Indoor plants while aesthetically beautiful also have great health benefits. When using indoor plants in guest rooms designers work to bring in a yin and yang effect by having the softness of the plants contrasted by the carrier that they are in, which is usually of a more solid and concrete material. Guest rooms that have a contemporary design focus opt for a more playful design, and the best way they accomplish this is through colors and bold printed rugs. Rugs can work to give the room character and also work as an accent detail if you don’t want to use color. Different rug textures and prints are used to accomplish this look of creative rugs. Geometric design is a big part of contemporary design. Geometric hotel room design trends are a new take on how the structure of a piece should look like. Geometric detailing works to add a unique take on any piece and uniqueness is something we have all come to appreciate. Hotels are using geometric detailing in anything from furniture, to lighting fixtures, and wall hangings. Since contemporary hospitality design trends are ever changing, hotels want to embrace the current design and appreciate it for what it is and bring it into their hotels to enhance their guests stay.